Are you searching for a pressure gauge with a special dial? Sometimes custom gauge faces is just what you need. We make our own custom dials for pressure gauges when the manufacturer cannot offer quick or economical options. Why might you need one, you ask? Highlight and promote a company’s brand. A pressure gauge is a natural focal point on a piece of equipment and logo pressure gauge dials increase brand awareness. Promote your brand by putting your logo to the dial. A gauge dial with logo puts your brand front and center with your customer. And, to promote resale business, you can add your phone number, web address, gauge part number or other information right to the face of the pressure gauge. Email or call for a quote. Quick turnaround for obscure pressure ranges. Your customer needs gauges with an mPa range or kg/cm2 range as soon as possible and the lead time from the manufacturer is 6-8 weeks. While PSI and Bar are fairly common in the USA, other ranges like kg/cm2 and MPa are not. A custom pressure gauge face with the range needed can be quickly created and installed on a stock gauge to meet yours and your customer’s needs. Email or call for a quote. Create pressure gauges for hydraulic or pneumatic presses. Hydraulic or pneumatic presses indicate the force in TONS, POUNDS, or other force units applied to a specific area. (For a detailed description, see our blog post about tons on ram.) Presses are often rated in TONS indicating how much force they can exert on a piece of metal to form a fender, for instance, and the gauge need to accurately display that force. We have significant experience in getting this right, so contact us to get started. Email or call for a quote. Promote operator assistance and safety. If your procedures call for the pressure of your tank to always be between 50 and 70 PSI, a green wedge on the dial from 50 to 70 PSI makes it easy for the operator to get it right. Or, if your tank is rated to 100 PSI, a red “DANGER” range starting at, say, 80 PSI will make it obvious to the operator that action should be taken. 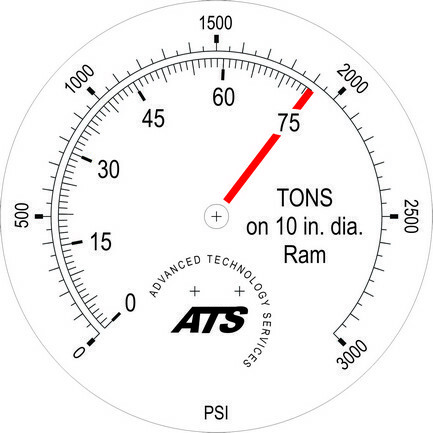 See the examples of custom pressure gauge faces we’ve created in the past. Email or call for a quote. Custom dials are created in house here at H J Kirby Corp. which means we can offer single or smaller quantities quickly and economically, compared to the manufacturers themselves. We have developed an effective and efficient process that allows us to deliver most custom orders within a week - from initial concept to artwork to finished product, - if the gauges themselves are in stock. We charge roughly 1/5 of the manufacturer’s artwork charges, always email you a color copy of the image for approval, and turnaround is super quick. Call or email us for a quote. You might be pleasantly surprised.